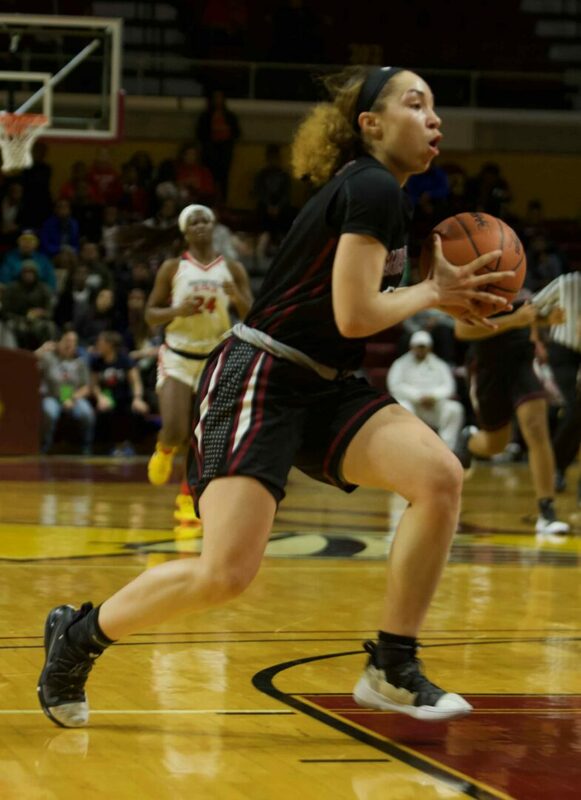 GRAND RAPIDS – There are different ways to look at the Muskegon girls basketball team’s exciting and heartbreaking loss to Southfield Arts and Technology on Friday at Calvin College in Grand Rapids. On one hand, the Big Reds stunned and impressed the crowd by fighting all the way back from a 16-point halftime deficit and pulling with two points with less than a minute left in the game. But the what ifs will never be answered, and the Big Reds were left with a 54-50 loss in the Division 1 state semifinals. 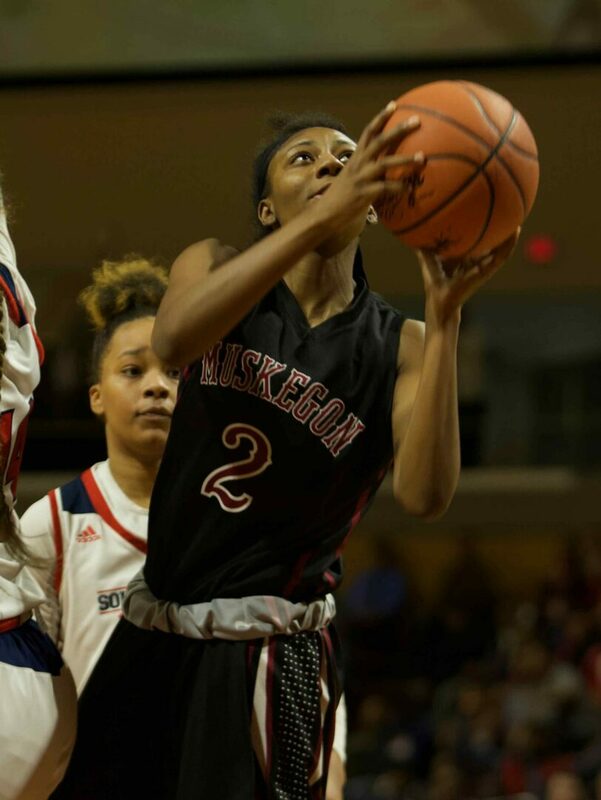 Muskegon finished its outstanding season with a 21-5 record, and won the O-K Black Conference championship and district and regional titles along the way. The run to the semifinals was the farthest the Big Red girls have ever advanced in the state tournament. Southfield A&T advances to Saturday’s state title game against Saginaw Heritage, which beat Wayne Memorial in the other Division 1 semifinal. The game appeared all but over after a terrible first half for Muskegon. Both teams had trouble getting on track in the first half, and nobody scored until 2:43 had passed in the game, when Southfield’s Alexis Johnson hit a jumper for a 2-0 lead. The rest of the half belonged to Southfield, which led 13-2 after one quarter and 29-13 at halftime. Johnson led the Warriors with 10 points in the first two quarters. Muskegon, meanwhile, misfired badly in the first half, hitting only 1 of 18 shots in the first quarter and 4 of 12 in the second. The Big Reds were also crippled by eight turnovers in the first half. The Big Reds’ shooting improved as the game went on. They made 12 of 30 shots from the floor in the second half, but finished at only 28 percent, due to the icy cold first half. Muskegon didn’t get going from 3-point land until late in the game. The Big Reds were 1-for-5 in 3-point tries through the first three quarters, and ended up making only 3 of 20 attempts in the game. “It was just one of those where the lid was on the basket,” said Muskegon Coach Rodney Walker. “We couldn’t buy one. We started really, really slow, and I thought we had some good shots, but the ball just rolled in and out. But like they have all season, the Big Reds fought back, with Winston leading the way. 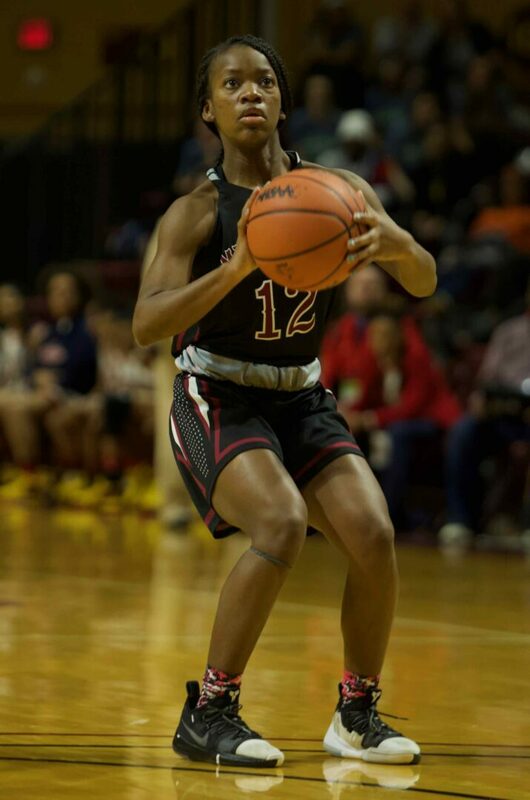 They opened the second half with a 10-2 run, sparked by a jumper from Kailyn Nash, a layup by DaShonna Day, and six quick points from Winston, to narrow their deficit to 31-23 with 2 1/2 minutes gone in the third quarter. Southfield rebuilt its lead to 44-31 after three, and it once again looked like Muskegon would fall far short. Then the Big Reds roared back again, opening the fourth quarter with an 11-2 run over the first four minutes to pull within four points, 46-42. Winston led the uprising with five points, Day added four and Brianna Alexander sank a pair of free throws. Muskegon trailed 52-44 with under three minutes left when it made its final move to complete the comeback. Jakayla Anderson hit a huge 3-pointer with 2:28 left, making the score 52-47. Southfield still led 52-47 with 1:50 left, and with no shot clock in play, held the ball for 39 seconds before being fouled and going to the line for a 1-and-1. 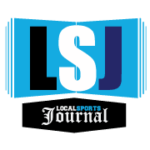 But the Warriors were called for a lane violation on the first free throw with 1:11 remaining, giving the Big Reds the ball and another opportunity. Day nailed a triple with 51 seconds left, making the score 52-50, then Southfield turned the ball over in its next possession when a player stepped out of bounds. Muskegon went for the game-tying shot, and Winston drove the lane for a layup, but was called for travelling with 16 seconds remaining. Television monitors on the sideline noted contact with a defender, and it appears she might have been fouled on the play, but the travel call stood and Southfield got the ball back. The Big Reds were forced to foul after that, and Southfield’s Soeil Barnes hit two free throws with six seconds left to seal the victory. 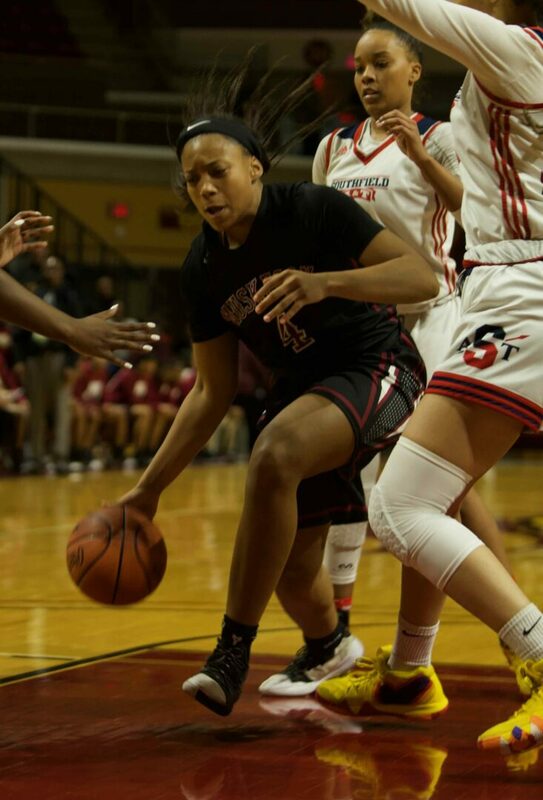 Johnson paced Southfield with 18 points, while Cheyenne McEvans and Barnes each scored 12.